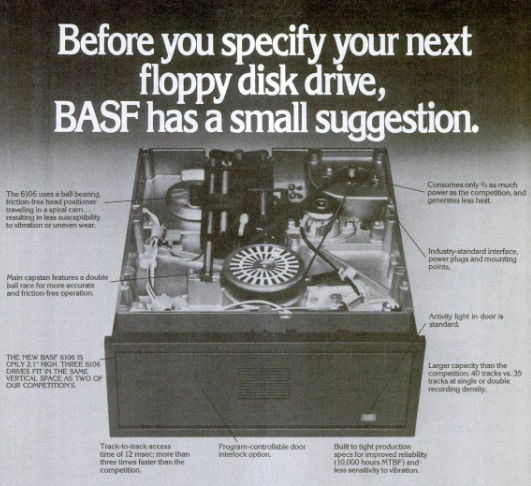 Excerpt from the operating manual of 1978: "The BASF 6106 and the BASF 6108 mini disk storage are small, compact, reliable and reasonably priced floppy disk memories. The BASF 6108 is a dual-head memory, backwards compatible with the BASF 6106, but with twice the storage capacity. The recording method on both devices is either FM or MFM depending on the controller. The BASF 6106 and BASF 6108 mini-disk storage offers outstanding potential applications as peripheral data storage for small and desktop computers, point-of-sale terminals and word processing. These BASF mini-disk storages offer a powerful alternative to punched tape input and output devices, magnetic tape cassettes and magnetic card readers in many applications, more performance and higher reliability are achieved with the same or smaller size and comparable costs." The newspaper advertisement of December 1983 can probably be deduced indirectly that the 6106 was an obsolete model in 1983. 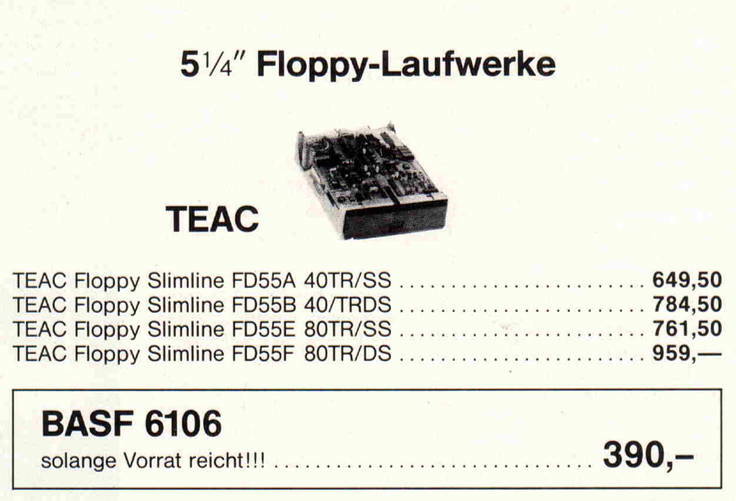 In comparison, TEAC's modern floppy disk drives were really expensive. The FD55F (DS/DD) costs almost 1,000 DM! The BASF 6106 is a wonderful old floppy drive with a real HEAD LOAD. When the read head accesses, there is a really loud crack when the head loading magnet presses head onto the surface. Basically, I can say about my BASF 6106 that my circuit board does not match 100% with those in the manuals. For example, the test point ranges TJ1 and TJ2 are missing. There are fewer test points on my board and these can be found elsewhere. It is possible that the boards of the later 6116/6118 were also installed in the older 6106/6108 in the final phase. The jumper settings are the nuts and bolts when connecting the 6106 to the PC. Wrong jumper settings and the 6106 behave like a machine gun; Stepper and in particular the head loading magnet (HEAD LOAD) play crazy! Setting the jumpers correctly is a real challenge. You have to print out the following overview and enter your options step by step, then mark the top and transfer them to the drive. But! On my 6106 the labels JJ-2 to JJ-4 do not appear. There are only the labels 2D to 5D. I had to try for a long time. With the following settings my BASF 6106 works very well on the IBM PC 5150. 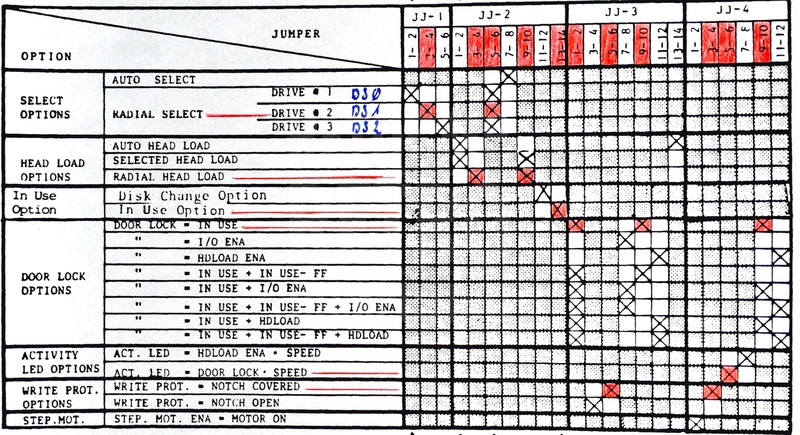 My jumper settings are shown in the following figure. I use the 6106 as a single drive, as drive A:. According to the settings, the 6106 has been jumpered as the second drive (DRIVE 2 or DS1). Why? The 6106 has the appearance of a normal floppy connection as everyone knows, but ...! The 6106 comes from pre-PC time and still uses the original Shugart interface (DS0-DS2). Here, however, the lines 10-12 are occupied differently. However, this problem can be easily solved with a twist on lines 10-16. 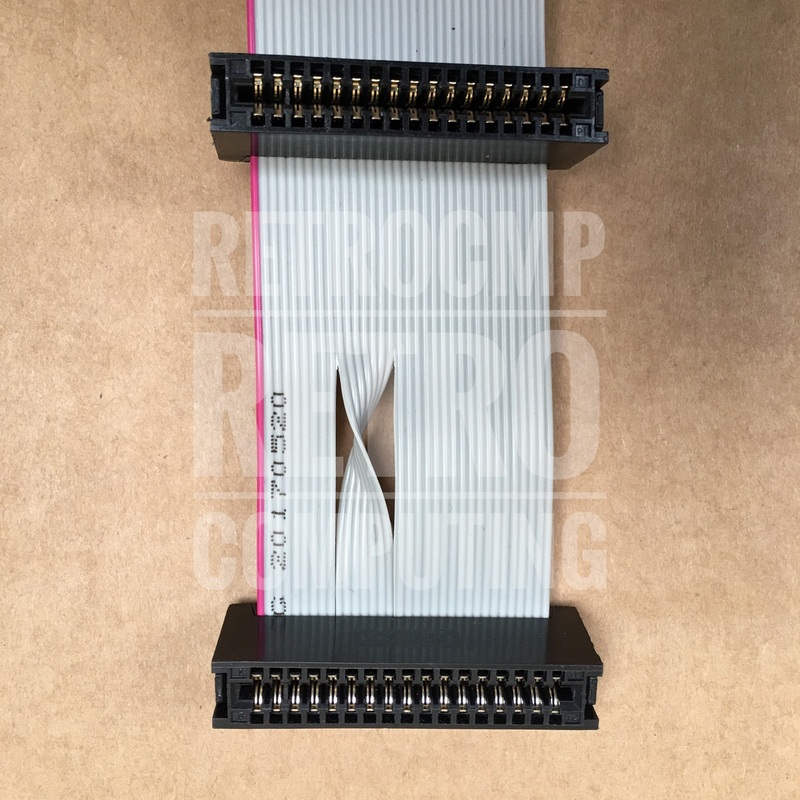 In other words, take the known floppy cable from the PC time, this one has a twist on the leads 10 to 16 and connect the 6106 at the end, behind the twister! That's it. When the PC controller sends the MOTOR ENABLE A (10) signal, the 6106 will receive it at MOTOR ENABLE (16) correctly. Likewise DRIVE SELECT A (14) on DS1 (12). With this jumper settings, the 6106 works perfectly on my (old) test system no. 2 and the IBM XT 5160. The most important copies are listed below. The last manual is with parts catalog and breakdown; very important!